What Is WebRTC? How It Works And What Is It Good For? How long have we been using the Internet? For a decade or two? In fact, some may have been using it even before that. We browse the Internet for doing business, making online transactions, using social media, watching live streams, etc. Apart from that, we also use the Internet for real-time audio and video chat using services like Skype, WhatsApp and such. Regardless of how long we have been using these technologies, we never take a moment to understand why the technology is necessary or how it works, unless when we come across a problem that compels us to dig deep and learn more about it. What Makes WebRTC a Popular Technology? What Is WebRTC Used for? What Is WebRTC Leak and Why VPN Users Should Fear It? How To Avoid WebRTC Leak? So, what is WebRTC? It is indeed one of those questions (or problems) that often troubles netizens, especially when it comes to VPN users. Read on to learn what the technology is all about, how it actually works and what aspects of it do VPN users need to be aware of. WebRTC stands for Web Real-time Communications. As the name suggests, it is a technology that allows peer to peer communication between browsers or devices. The communication can be in any form, i.e., data sharing or real-time text and video conversation. WebRTC started as an open-source project in 2011 by Google, and since then the technology has evolved significantly. Since WebRTC is an open-source project it is completely free to use and developers from all over the world are utilizing WebRTC API to build different Web apps. In fact, most popular free browsers like Chrome and Firefox have built-in WebRTC technology. Now, WebRTC is deemed as a standard real-time communication means by the Internet Engineering Task Force (IETF) as well as the World Wide Web Consortium (W3C). Before the advent of the WebRTC technology, users had to waste their time on installing and using third-party plugins. Moreover, developers had to deploy C/C++ (a programming language) which requires time and resources due to never-ending development cycles. Apart from the APIs, WebRTC comes built-in in various popular browsers like Google Chrome, Mozilla Firefox, etc. It is also important to note that WebRTC isn’t limited to web browsers but the technology also expands to mobile OS. For instance, you may use WebRTC on Android. Since WebRTC allows real-time communication or data sharing, it requires the actual local IP of the endpoint to connect. To communicate with the other browser, the technology needs RTCPeerConnection. The technology then passes through a Session Description Protocol (SDP). However, due to the involvement of a Firewall or a NAT (Network Address Translation) traversal, the two peers cannot see each other’s local IP to connect. 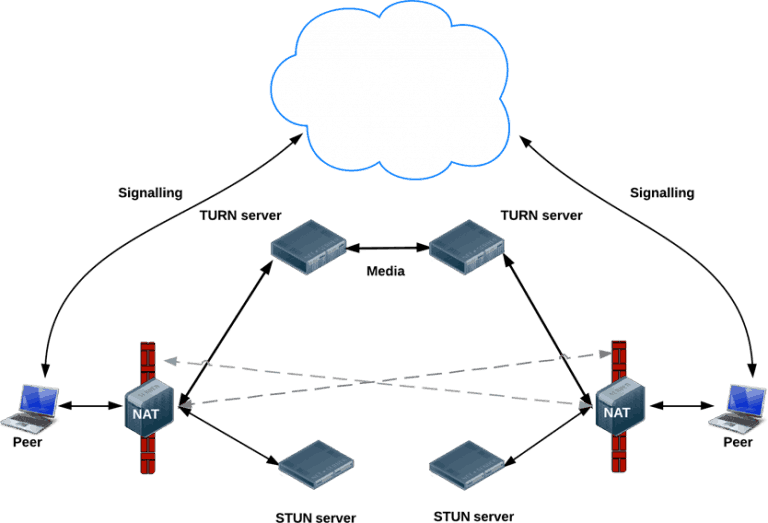 Here, STUN (Session Traversal Utilities for NAT) / TURN (Traversal Using Relays around NAT) servers help the peers get connected. There are a great number of WebRTC use cases that can range from simple audio or video communication to file sharing or even screen sharing, etc. WebRTC allows users to communicate with one another through their web browser (such as using Skype or WhatsApp), without installing any additional plugin or add-on. Since the technology provides the live interaction feature between browsers, such a capability can be used by customer support so that they can answer queries in real time. Truth be told, there are a great number of services that are using the WebRTC technology as a business model, offering browser-based live communication services to users around the globe. WebRTC isn’t limited to online communication but the technology extends its use to even file sharing as well as screen sharing. So, you may be wondering is “Is WebRTC Secure?”. Yes, WebRTC is secure as it uses end-to-end encryption. As a result, no 3rd party can pop in to see your data. But if you are using a VPN, the bad news is that WebRTC might leak your I.P address. While WebRTC offers multiple benefits, WebRTC leak is a glitch that affects the Firefox and Chrome browsers on Windows. Therefore, if a user is behind a VPN and the VPN isn’t WebRTC leak protected, then the glitch may leak the user’s real IP address. In fact, you can easily check whether your browser is leaking your IP address or not. Heads Up! Your browser might be leaking your IP address click here to know more. If the real IP address is leaked, the user would be exposed to government surveillance, ISP monitoring, hackers, or other cybercriminals. Users use a VPN to not only circumvent content that is not available in the region but also to make their online data secure which is possible through the VPN’s encryption protocols. Hence, a VPN not just provides its users with anonymity but also complete online security. It is because of that users try to find ways to prevent WebRTC leak. Since WebRTC leak is a serious concern for VPN users, it is important that the matter is dealt with immediately. Luckily, there are preventive measures through which you can disable WebRTC leak on Firefox as well as on Chrome browser. Learn how to prevent WebRTC leaks in Firefox and Chrome browsers. Since the technology hasn’t been implemented on all the commonly used web browsers, users may have to stick to the non-WebRTC means to communicate with their loved ones. Regardless, for VPN users, WebRTC leak may translate into huge problems which is why it is necessary that they take the necessary steps to prevent the leak.